©2006 Debra Brown Gordy, MS MRET. All Rights Reserved. Energy Psychology works at the subtle energy and causal levels. 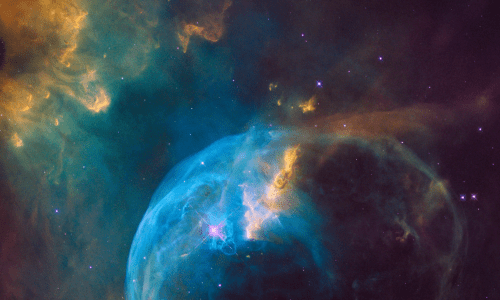 This is the Bubble Nebula in the constellation Cassiopeia. Nebulas are the birthplace of stars. Energy Psychology comprises an innovative family of approaches that build on our understanding of body/mind psychology and utilizes various aspects of the human energy system. This system includes the bio-field that envelops the body, the energy centers, and the energy pathways. Positioned on the shared frontier of psychology, biophysics, and spirituality, Energy Psychology techniques show promise and remarkable effects in treating and alleviating physical, emotional, relationship and spiritual distress. These include the relief of trauma, phobias, anxiety, stress, addictions, compulsions, allergies, personality concerns, long-standing relationships problems and learning disorders, to name a few. Energy Psychology tools are also effective in promoting high level health and peak performance on the physical, mental, and creative levels. Often within minutes of using Energy Psychology tools, physical or emotional symptoms are greatly reduced or no longer present. The prevailing premise of Energy Psychology is that the flow and balance of the body’s electromagnetic and more subtle energies are important for physical, emotional, and relationship health, and there are energy-based methods that help in fostering that well-being. These influence each other and each may promote health and well-being. The relationships you have with others, your community, the environment, and spirituality may also impact your health and well-being. A client’s work with me may focus on any combination of these in order to most effectively help you obtain your goals. You may have heard of subtle energy through such terms as life force, chi, meridians, chakras, bio-fields, or auras. These energies are called “subtle” because they are not commonly detectable through our five senses. However, many people for centuries and across cultures have described seeing or feelings subtle energies to varying degrees. Measurable energies are the fabric of our existence. Electrical, chemical, and nuclear energies are some of the more common forms of measurable energy with which we are familiar. For example, doctors measure electromagnetic fields or energies of the body through EKGs, EEGs, and MRIs. These measurable energies are clearly an important part of our everyday health and well-being. Physicists have been dramatically changing our understanding of energy. For example, Einstein proposed that all mass is comprised of energy. That is, all “solid” objects, including our bodies, are comprised of molecules in constant motion that can be influenced by outside forces. Despite the advancement of physics, we still don’t understand certain ever-present fields of energy, such as gravity. Much remains to be learned about the energetic functioning of our world and universe. Subtle energy is one of those forms of energy still being explored. It is considered part of the ever-present energy from which all matter is derived, in the sense of Einstein’s E=mc2, i.e., matter is a form of energy. Some scientists believe our physical bodies emerge from a field of subtle energies. In many healing traditions, the “life force” that distinguishes life from death is understood as involving the presence of subtle energies. Energy Psychology works at this level - the level of energetic creation, and suggests that by promoting balance and flow in these fields of subtle energy, the health of the entire person—spirit, mind, and body—is enhanced, and relationships with others can be greatly benefited as well. Despite not fully understanding the nature of subtle energy from a Western paradigm, there are numerous methods designed to influence these energy systems, such as acupuncture, yoga, acupressure, Reiki, and tai chi, to name just a few. Many Asian cultures have studied these energies and methods for centuries and have successfully applied them to both physical and emotional health (e.g., Deadman et.al, 1998). Subtle energy effects and its healing role are being used in a wide variety of settings in the United States and elsewhere. Many hospitals in the US now include subtle energy methods (e.g., Reiki, Healing Touch, and acupuncture) to help with the healing of a variety of conditions. Further investigation is being conducted by the U.S. National Institute of Health through a center of research called The National Center for Complementary and Alternative Medicine. Another example of the growing professional interest in subtle energy is the formation of an organization for psychotherapists, coaches, researchers and other practitioners of the healing arts: the Association for Comprehensive Energy Psychology (ACEP), whose annual conference attracts hundreds of practitioners from around the world. Their web site, (www.EnergyPsych.org) has up-to-date research articles on the role of such energies in psychotherapy and coaching. What is the Role of Subtle Energies in Spiritual Life Coaching? Energy Psychology is based on the premise that by affecting electromagnetic and more subtle energies there can be a shift in emotions, thoughts, and behaviors. There are a variety of methods that appear to have an impact on subtle energies. A common method is based on the ancient principles of acupuncture. It is a simple procedure that gently balances the energies without the discomfort of needles. Clients recall a troublesome thought or feeling and are taught which acupuncture points on their body to stimulate through tapping, rubbing, or holding (rather than using needles). The stimulation of such points, sometimes referred to as acupressure, has been observed to reduce psychological symptoms. This is a method I use, and you will learn a variation of as a self-care tool. Another method targets the energy centers of your body, called chakras, which are considered to hold emotional memories. To affect these energies, I might move or hold my hands near your body while you sit on a chair, or instruct you how to do so when working during a phone or video session. The theory behind chakra clearing is that electromagnetic charge of the hands is interacting with and balancing the electromagnetic fields of your body. Most people experience a pleasant feeling, while others may recall the old distresses we are targeting and releasing. Rapid Eye Technology (RET). RET is a holistic, spiritual, energy therapy, based on your own rapid eye movement (REM) state of sleep. When we simulate this state while you are awake, we are able to access and release past hurts, unfinished business from your past, trapped traumas and emotions, memories and subconscious beliefs that are often at the root of patterns of pain and struggle in any area of your life. This method includes such techniques as eye movement, blinking, breathing, visualization, and activities or exercises, all designed to assist you to release patterns of imbalance in the subtle energies in your body, and replace them with new ones that serve you better. I am a Master Practitioner of Rapid Eye. Soul Detective™ Multidimensional Healing & Transformation Protocols. These are advanced specialty protocols that help clients heal the origins or the “invisible roots” of their complex emotional wounds. Through connecting to a woman’s True Self and her own Inner Guidance, this modality empowers a client to fulfill her soul’s mission in life and to joyfully express her gifts and talents to help bring personal and planetary peace and harmony. I am an advanced practitioner of Soul Detective Multidimensional Healing and Transformation. There are numerous other Energy Psychology methods; all designed to balance the flow of subtle energies. For a review of these energy systems and the methods used to enhance them, see Eden’s book, Energy Medicine (1998), Gerber’s book, Vibrational Medicine (2001), and the web site for the Association for Comprehensive Energy Psychology (www.EnergyPsych.org). There is a method to assess where your subtle energies are out of balance, which I occasionally use. It is a simple procedure where I apply light pressure to one of your arms. The degree of firmness you experience indicates whether there is a disruption in the energies. This method has a variety of names such as Energy Checking, Muscle Testing, and Applied Kinesiology. It has been used extensively by osteopathic and chiropractic physicians as well as physical therapists. Psychotherapists started using this assessment tool about 15 years ago. This then, is a succinct introduction to Energy Psychology, and how I use it in The Sophia Method™ of Spiritual Life Coaching. If you would like to know more, please review selected references here. In summary, The Sophia Method™ of Spiritual Life Coaching and Multi-dimensional Healing and Transformation makes a life-changing impact in clients’ lives and relationships, and Energy Psychology methods are at the heart of these transformative changes. This approach to healing and growth is one of the fastest-growing, and I believe most promising of all the newer approaches to healing, personal growth and Self actualization. I feel thrilled and excited daily to use these resources with my clients, students and trainees, as I am a witness to the miracles they receive in their lives through its use. Energy Psychology is the exciting science behind the magic of lasting healing and transformation! Contact me today to discuss how I can help you transform your life or marriage with the magic of these cutting-edge resources.